Home › Forums › Getting Started- Introductions › Hello! Hi I’m Tom, I currently study Biomed science, however my intention is to study Post-Graduate Medicine once my current degree is finished. If anyone has any advice or even any things that you would recommend that I do before I apply in the future (e.g A certain Work Experience) that would be greatly appreciated. Hello my name is Tim and I’m a GP trained and working in the South West of England. Ive worked on projects trying to improve access to work experience placements and currently work in a role helping support GP trainee doctors return to work (SuppoRTT) after a period of time out. I only discovered this site today following links from one of my neighbouring regions SuppoRTT websites and looks like a great resource! I studied Genetics and university and now I’ve just joined Generation Medics! I really hope I might be able to help answer any questions you might have and maybe provide some useful insight for people making decisions on their next steps. My name is Lydia and I’m the Generation Medics Digital Health Champion. I have worked in the NHS as a doctor for the last 6 years and I specialise in Ear, Nose & Throat Surgery. I’m the acting Programme Lead for the NHS Digital Academy where we teach digital health to senior leaders in the NHS. I took a few years out of medicine whilst exploring digital health which I’m happy to discuss with others considering time out. Digital health (also called clinical informatics) has been around for a long time but has recently been much more visible in healthcare and the media. It covers the use of technology to deliver care and manage information. Please get in touch if you have any questions about anything above. Happy to help in any way I can! I am in year 12 at the moment and in the process of choosing which subject I will have to take as an As level. I have wanted to go into medicine for the last five years, I can’t imagine a better career for combining the sciences with the chance to interact with others. I have only just found out about this website and am very pleased to meet you all. Welcome John, great to meet you too! Choosing A Levels/AS’s can be tough. We have a couple of blogs on this coming out soon. Best advice would be to take a look at our list of all the UK Medical Schools here, and from there pick out at least 10-12 that you’re interested in. Click through to their websites and then check out which subjects they require. Almost all require Chemistry, most like Biology but the third and any additional choices could be less sciencey. Check out the requirements. hi everyone I’m Alice and I have wantedt o be a doctor for as long as I can remember. I dont know anyone esle who wants to go to uni near me let alone be a doctor so Im really excited to join in with this. Chris I haerd about this from cambridge uni too! did you apply to do the programme there? It must be really tough not having people around you. I know it was really helpful for me to have a few other people from my area interested in Medicine although we did all end up being really competitive with each other! I got an email from Cambridge recommending you so here I am! Before I came to uni I went to your Aspiring Doctors conferences and the National medical applicants conferences at Oxford uni and that’s where I met you guys when you were still help me i’m a medic… they were both amazing and I loved the experience so much they made me sure I want to be a doctor. I’ve still got my folders from the conferences and all of my notes about the procedures i got to do!! I’d also love to find out more about what its like to work in different specialty areas because i have no idea what i’ll go into after uni! Hi, my name is Sanjana and I’m an A level student studying Maths, Chemistry and Biology. I’m hoping to become a doctor but haven’t decided what field in particular, probably surgery. Is there any particular type of surgery that sounds good to you? Hello, my name is Kate and I am an A-Level student. You must be busy at the moment with revision, so we just thought we’d share some resources that will be useful to you. We don’t want you to miss out on any opportunities! For revision check out our ‘Top Tips For Revision’ blog. If you want to find out more about career insights, check out our ‘Here’s what it’s like to be an Occupational Therapy student on placement’. We also have really interesting playlists on our Youtube channel for Nursing, Occupational therapy and more. My name is Furkan and I have just logged on for the first time to Generation Medics. I think the website looks quite helpful, with exam questions and answers to test me whilst I’m not in revision mode. I was looking to start my personal statement in the next few days and I was wondering whether there are any medical staff or students that can help me start it and provide me with tips on how to successfully produce something universities are looking for. 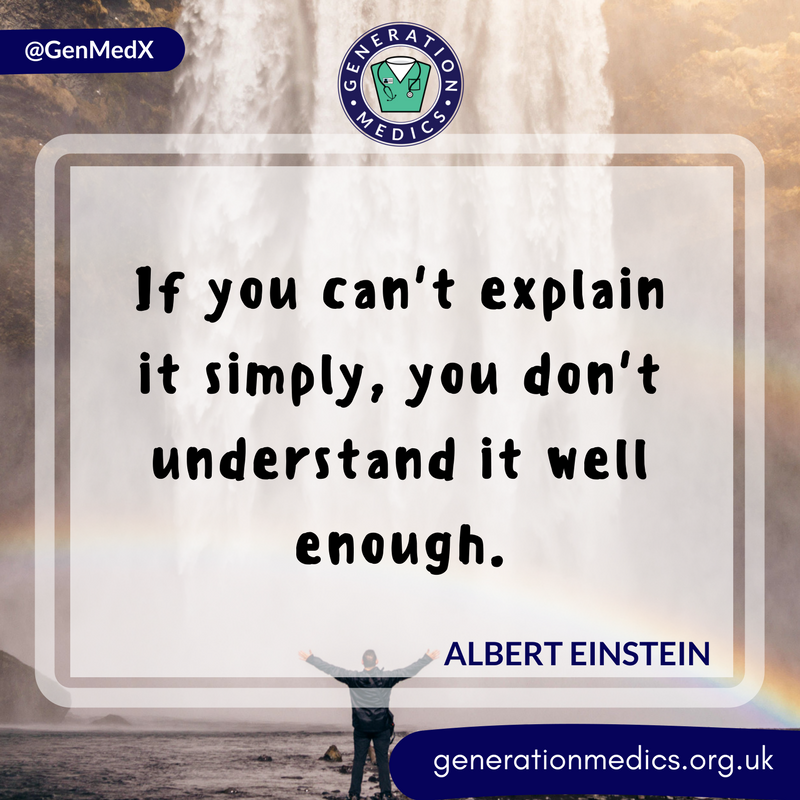 This thread is more for introducing yourself so tell us a bit more about yourself here and please pop your question over into https://generationmedics.org.uk/forums/topic/questions-health-students-health-professionals/ I know there will be plenty of tips and helpful tools that we’ll be sharing to help with your personal statement there! It’s amazing to hear you’re so motivated about your future! I just wanted to share some useful resources with you so you don’t miss out on any opportunities! I’m in sixth form studying Maths, Biology and Chemistry. I have applied for medicine 2018/19 entry. The new medical schools blog was interesting, I guess it might be easier to get into medical school in the next few years..
Here’s a motivational post for you all to help you kickstart your weekend on a good note. This one’s particularly important for everyone revising at the moment! Awesome to hear that the GenMedX club at your school helped you!  Are there any particular careers you’re thinking about now? Medicine is honestly so fun and there’s so much variety within it! Are there any job roles in particular that you’re thinking about? Are there any specialty areas you’re already thinking you’d enjoy working in? Hello my name Thilaxshika and I’m 14 years old in Year 10. I want to study medicine and I’ve taken this option to fulfill my dreams and having my parent’s support makes me stronger everyday but I’m not sure what I want to be in the future. I also want to travel the world and help people who suffer major illnesses and those who need help. In my opinion, the biggest obstacle to study medicine in the future would probably be moving out away from home as I already live away from my dad who works in Germany. I bet it’s tough living away from your dad! The idea of moving away from home to study can be really scary, but actually almost all of the rest of your class will have done the same thing so in a way it’s really nice. I’ve met people from all over the UK and international students too who I would never have met if I stayed at home. There’s so many medical schools right now that you’ll probably be surprised to see that you can probably find universities to study quite close to you! Hi my name is Bismah and I am currently studying my GCSE in yr 10. When i’m older one of the few things i want to be is a councilor. I have always wanted to be a councilor but recently I have had a stronger passion for it. Honestly I don’t know why I want to be a councilor so bad. How was Y10? Are you nervous for Y11? My name is Uwais and i am currently studying my GCSE in yr 10 and when i’m older i want to become a surgeon, a neurologist or a biomedical scientist/research into diseases. I want to do this as my sister had a brain illness and this made me look into the jobs and i felt it was interesting so i wanted to do it. My biggest hurdle i need to overcome is hitting a high grade such as a B/A in physics. That’s an inspirational reason to want to join a medical profession! So many of my friends have chosen Medicine for similar reasons. Not all universities will require Physics, so your biggest hurdle might not actually be what you think it is right now. Did you sit any exams before the end of Y10? Hi, I’m Helen. I’m 15, going on 16 and am currently neck deep into year 11. One day I hope to enter either general practice or become a biology teacher. I’m currently studying English lang+lit, maths, chemistry, Biology, Physics, art, textiles and music. I’ve studied modern history. I’ve got ASD but I don’t let it bother me too much. And in my spare time (Or rather what’s left of it considering revision and homework have utterly dominated any time I’d previously had…) I like to escape reality and create cosplay outfits or customise dolls. You must be waiting for your GCSE Results – I remember being worried in the week before! How are you feeling? I’m Husnain (age 14) and I’m studying my GCSE’s. I am an advanced First Aider for St John Ambulance and I have been doing this for over a year. One of my favourite events was when I volunteered at Adams Park for Wycombe Wanderers. At the event, whilst watching the crowd I saw someone fall over the balcony. I ran to the patient only to reveal he was ok after a check-up and had no injuries. The patient was well and discharged on scene. My future hopes are to become a specialist practitioner or an advanced paramedic. Your experience as an advanced first aider sounds amazing mate. Your patient sounds lucky! I know quite a few people here at my uni who volunteer through St John’s but they are only just becoming first aiders/advanced first aiders now!! Radiology in medicine is a sub-speciality for doctors. Here we combine the knowledge of how the body works with physics to analyse different organs and tissues within the human body. You can think of us as detectives trying to put the clues together, the clues are pictures of the human body. We then give our opinion on what we think could be causing a patient’s symptoms, or in many cases that there is no cause identified. The clinical team can then correlate this information with all the hard work they have done (taking a history, examining the patient, looking at their social situation and their past medical history/medications) and formulate a plan for the patient. Hi my name is Chloe, I’m starting college in September and want to be a nurse! I love Harry Potter and am a true Hufflepuff at heart. Good luck today Sam! Let us know how it goes 🙂 If you need any advice leave a message on the GCSE results thread! Hello everyone, my name is Dr.Priya Das and I’m a Birmingham and UCL graduate. I am currently a NW Thames medical trainee and have attended many Generation Medics OSCE sessions. I have enjoyed working with this team and am very excited about the future timetable! Hello everyone, I hope everyone has enjoyed their weekends and start to the week. We thought it might be helpful to give you guys a bit more of an insight into how to use the forum. So, if you’re a professional share your words of wisdom on our special ‘words of wisdom’ thread! This could be anything from the most useful piece of advice you were given as a student, your favourite inspirational quote, or maybe a little insight into your journey and the challenges you faced. If you want to interact in other ways on the forum, checkout the different threads and see if there is anything you can add to conversation or advice you can give. If you’re a student check all of our forums for what might be relevant for you. At the moment we have our ‘results day’ and ‘pre-GCCE’ aspiring doctors thread where you can ask questions and get advice. We will have more to come as we grow so keep an eye out! Also checkout the ‘words of wisdom’ thread, this is where you will get exclusive insights! I am a Junior Projects Officer and part of the Generation Medics team. I look forward to seeing what you have to say and getting involved. As mentioned earlier, if you have any concerns regarding the content on this forum, feel free to contact me. I’m also happy to answer any questions you might have, don’t hesitate to get in touch! I’m Dr Hinnah Rafique, Director of Generation Medics! I founded Generation Medics to widen access to medical and health careers for people from all backgrounds. We provide up-to-date advice, information and opportunities for aspiring health professionals. Our support does not end there, we provide career-spanning support which means that after you have begun training and even after graduation we’re still able to provide support and opportunities to help you succeed in your career! Looking forward to see what you have to say! I am part of the Generation Medics team and I am one of the moderators on the forum threads. I look forward to hearing what you guys have to say and getting involved! We have many people who work with us to help widen access to medical and health careers- including 100’s of fabulous volunteers! To help you distinguish who everyone is, we have added ‘GenMedX’ to the end of the names of our core team. We’ll introduce ourselves properly below, but if you’re concerned about any of the content on this forum contact Blerina (her username for this forum is @blerinagenmedx) or use the ‘Contact us’ page.